The balance sheet is a statement that summarizes what does a company own and what does it owe. The explanation cannot go any easier than that. Basically if you look at a balance sheet, you could see how well the company is doing. Based on the various parts of the balance sheet, you can calculate ratios, which are indicators of the health of the company. But about those ratios in other topics. The golden rule of Accounting is that the two sides of the balance sheet should always be equal. Hence the term “balance”. Assets comprise the left side of the balance sheet and the liabilities + stock options issues represent the right side of the balance. As you can see there are three important terms that have to be defined. An asset is everything that the company owns. The assets could be further divided into current (those that can be converted to cash within 1 year) and long-term (those that cannot be converted to cash so fast) assets. Liabilities are money that a company owes to the outside world. They are also divided into current and long-term liabilities. Equity is what a company owes to its shareholders. It is easier to explain the balance sheet with an example. Displays the balance sheet from the example at step 1. In brackets you can see the change in the different accounts on the current step. First we enter the $10,000 cash that the company receives from you as an investment. Since the two parts of the balance sheet should balance, you also need to enter something on the right side. And this is exactly the “issued capital” or stock. This is an oversimplified example, but let’s say that your first move is to buy a shop. You pay $5,000 in cash and you loan another $15,000. The loan is interest-free for the first 2 years. Displays the balance sheet from the example at step 2. On the left side of the sheet you enter your new shop under long-term assets and you subtract $5,000 from your cash reserves. In order to balance the sheet, you enter $15,000 on the right side under long-term liabilities. Your next steps is to buy some inventory (e.g. apples) that you are going to convert to juice. You buy $2,000 worth of apples, you pay $1,000 in cash and you promise to pay the rest at the end of the month. 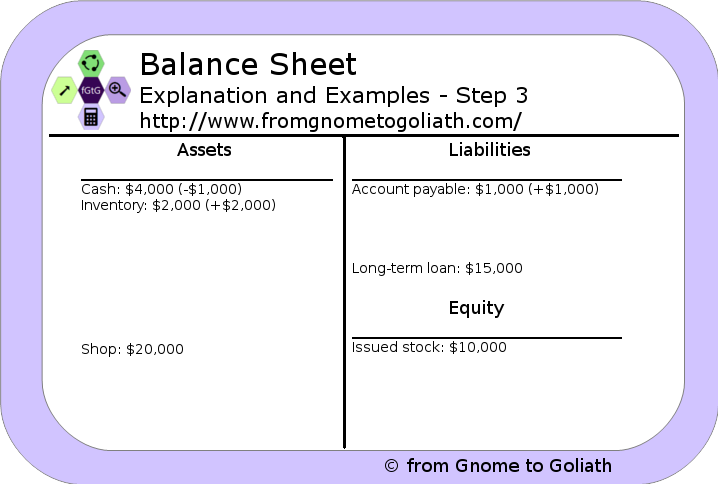 Displays the balance sheet from the example at step 3. On the left side of the sheet you now have $2,000 apples as inventory. You subtract $1,000 from your cash. And last but not least, you add $1,000 on the right side as account payable. Wonderful! Your balance sheet is “balanced”! Your business is doing great and you managed to sell $1,000 worth of juice by using $500 worth of apples. Displays the balance sheet from the example at step 4. You add $1,000 to your cash reserves. You subtract $500 from apples. In order to balance the sheet, you also need to enter your earnings and you do that as “retained earnings”. The balance sheet is an easy to understand, but very difficult to complete and maintain. As an entrepreneur you would only have to deal with that concept as soon as your company is big enough to require advanced (or complex) accounting. In most countries you only have to keep basic accounting as long as you are a self-proprietorship company and you are under a predefined threshold of income. Once your company is big enough, I recommend you to hire an accountant and let him or her do that stuff for you. But in any case, you need the knowledge of how to read a balance sheet if you want to progress.